The final two players (Je Wook Oh and Dino Moustakis) have agreed to an even cash chop, and Moustakis will take the trophy and first place. We will post photos in a few minutes. The 5♦ turn and 9♦ river are safe for Moustakis and he doubles up. The dealer confirms the total and 2,845,000 of Oh's chips are passed across the table to Moustakis. We are now heads up after the recent elimination of Matthew Wantman in 3rd place. Here is a look at the two chip stacks heading into the home stretch. 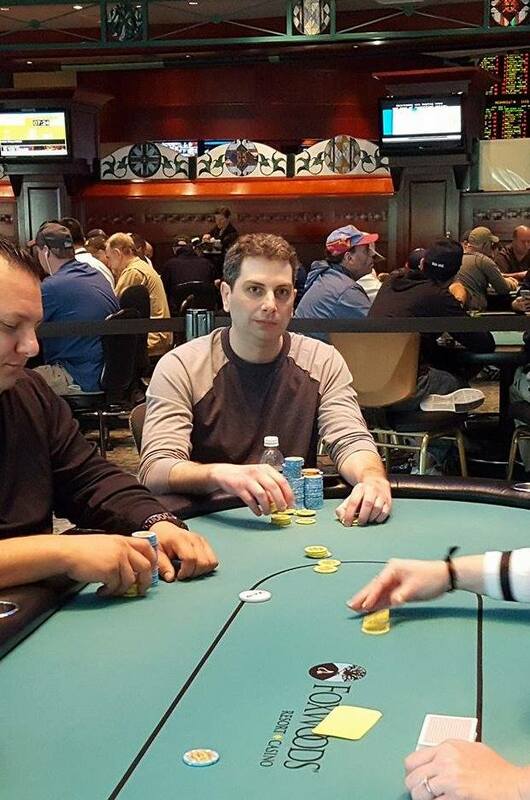 Dino Moustakis open shoves all in on the button and Matthew Wantman quickly calls in the big blind. The flop comes A♣K♥Q♠ giving Moustakis the lead with a pair of aces. "No ten on the turn please," Moustakis says. The turn is the 8♥ giving Moustakis a flush draw in addition to his pair of ace. 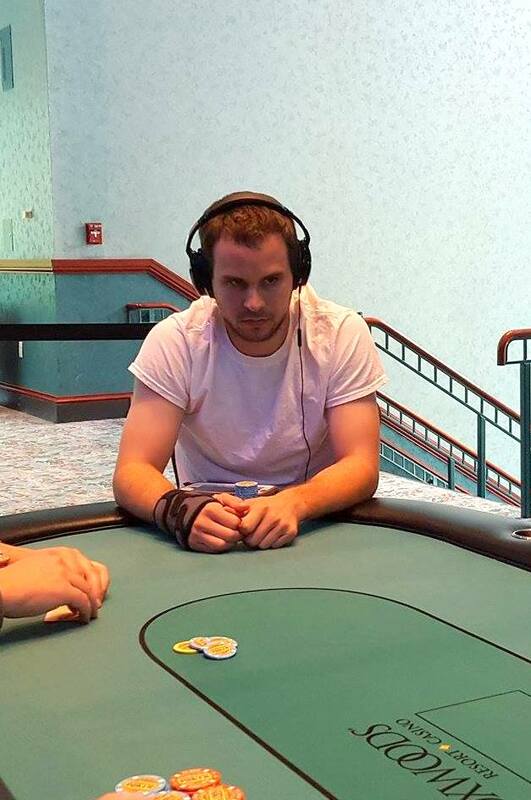 The Q♦ river does not help Wantman and he is eliminated in 3rd place. 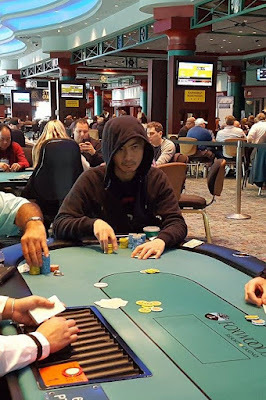 Dino Moustakis raises to 175,000 in the small blind and Je Wook Oh reraises to 500,000. Moustakis moves his chips forward (totaling 785,000) and Oh quickly calls. Moustakis held A10 against Oh's A8. The flop came 10-8-4 giving both players a pair, but leaving Moustakis in the lead. The turn and river were bricks, and Moustakis doubles up. Last year this same Main Event was chopped by Soukha Kachittavong, Je Wook Oh and Matthew Wantman, with Wantman taking home the most money ($107,000) and Kachittavong taking home the trophy. We are now down to the final three players and both Wantman and Oh are still in. Could history repeat itself and both of these players make it to the final two back to back years?? Keep your eyes peeled here at FoxwoodsPoker.com to watch it unfold. Action folds to Matthew Wantman in the small blind who moves forward a stack of chips totaling around 500,000, putting Gennadiy Kostrov all in, and Kostrov quickly moves his chips forward to call. The flop comes J♥9♣3♠ leaving Kostrov in the lead with his ace high. The 6♣ turn maintains that lead, but the K♦ river gives Wantman a pair of kings, and Kostrov is eliminated in 4th place. 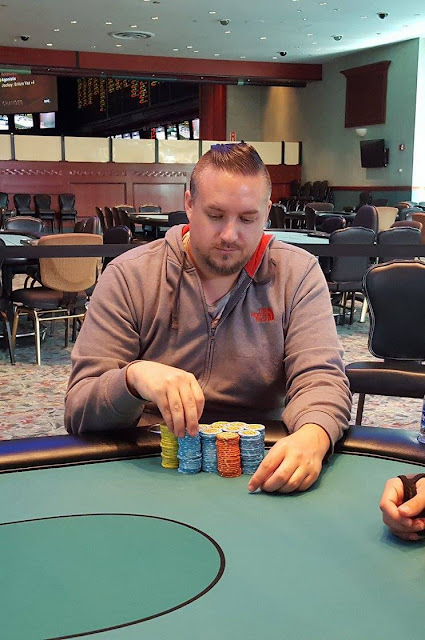 Matthew Wantman opens to 130,000 from under the gun and Brad St. Vincent shoves all in from the small blind for around 600,000. 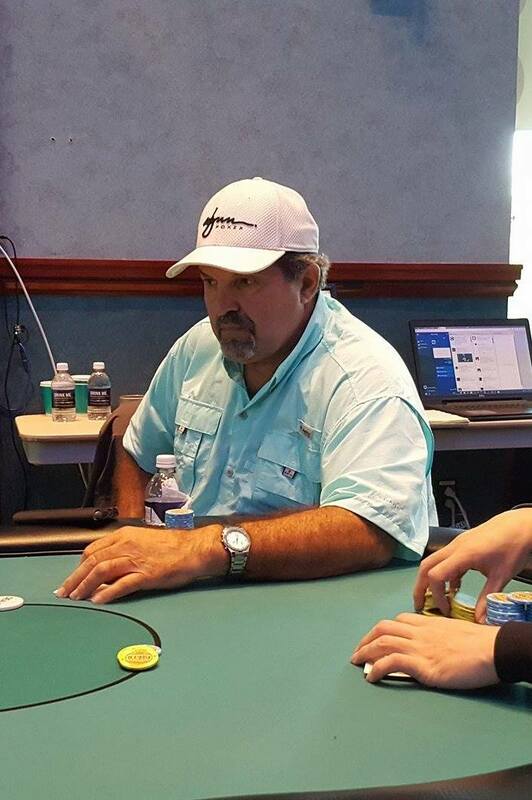 Wantman calls and the players table their cards. 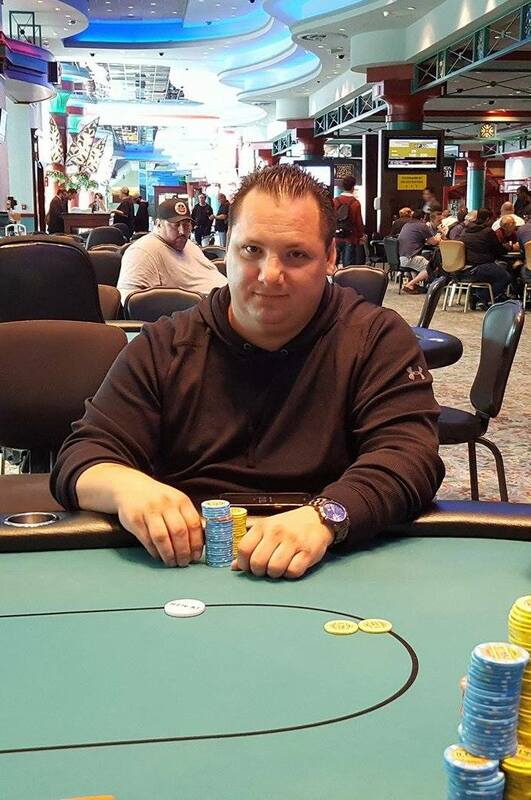 The board runs out 10♠5♦2♠9♦8♣ awarding the pot to Wantman and eliminating St. Vincent in 5th place. The remaining five players are now on a 60 minute dinner break. They will return to play Level 27 with 25,000/50,000 blinds and a 5,000 ante. The average stack will be 1,356,000. Brad St. Vincent raises to 90,000 from under the gun. Gennadiy Koslov calls in the small blind, and Dino Moustakis shoves all in for 610,000 in the big blind. St. Vincent announces that he is all in as well and Koslov folds. The flop comes 7♣5♣5♠ maintaining Moustakis the lead, but giving St. Vincent a a flush draw. The K♠ turn gives Moustakis a full house and the 4♠ river is inconsequential. Gennadiy Kostrov raises to 130,000 under the gun and Je Wook Oh shoves all in from the small blind. Matthew Wantman folds his big blind. Oh is behind holding A♣Q♥ against Kostrov's A♥K♠ . The flop comes 6♣3♣3♥ leaving Kostrov in the lead but the Q♦ turn gives Oh the lead with a pair of queens. The 7♥ river is safe for Oh and he doubles up. There's nearly 200,000 in the middle and a board reading A♥9♦2♥ when Matthew Wantman shoves all in for 855,000, and Brad St. Vincent calls. The 8♣ turn and K♥ river are safe for Wantman and he doubles up. Steven Brackesy shoves all in on the button, and Matthew Wantman reshoves for more in the small blind. Gennadiy Kostrov folds his big blind. The flop comes 7♠6♣5♥ giving Brackesy a gutshot straight draw, but the 2♠ turn and 5♠ river do not improve his hand and Brackesy is eliminated in 6th place. There were a total of 153 entries in today's $300 NLH Big Stack Turbo event, and 52 players remain in the field. They are now on a color up break, and will return to play Level 16 with 1,500/3,00 blinds and a 500 ante. The average stack coming back will be 88,269. For a look at the full payouts/prizepool for this event, please see this link. There were a total of 153 entries in today's Event #23 ($300 NLH Big Stack) Event, generating a prizepool of $38,587. 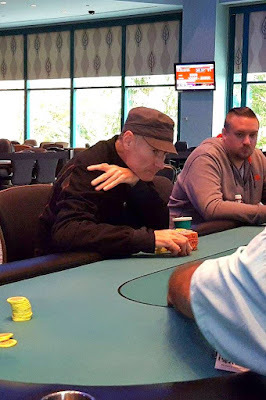 There's around 140,000 in the middle and a board reading K♥6♣5♦ when Dino Moustakis shoves all in for around 325,000, and Brad St. Vincent snap calls. Moustakis turns over 7♥6♥ for a pair of sixes and St. Vincent shows A♣A♦. St. Vincent maintains his lead when the turn comes the 5♥ but the 9♥ river gives Moustakis a flush, and he doubles up. Gennadiy Kostrov raises to 90,000 in the hijack and Carlo Sciannameo says, "I think I am going to have to go all in," as he moves his remaining 325,000 chip out in front of him. Kostrov quickly calls and the players table their cards. The board runs out Q♥4♥2♣J♣A♦ awarding Kostrov the pot and eliminating Sciannameo from play in 7th place. Facing an open from Brad St Vincent Justin Adams shoves all in for around 250,000 on the button and St. Vincent calls. 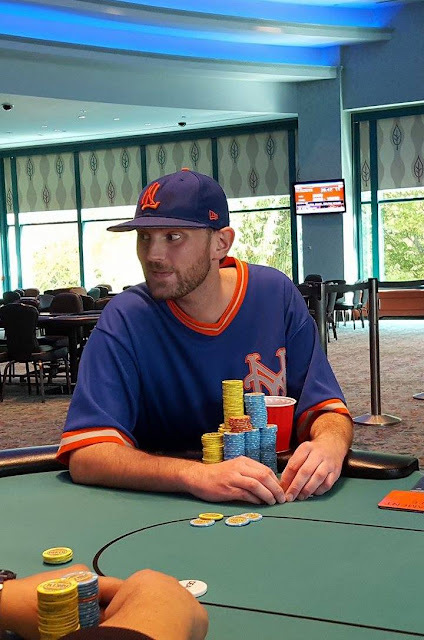 The board runs out K♠6♦2♣Q♣9♣ and Adams is eliminated in 8th place. Chris McIntyre was just left with less than a single big blind after doubling up Je Wook Oh. 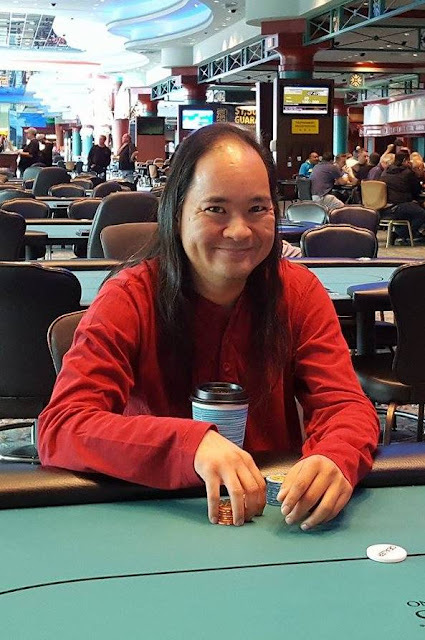 He is now all in under the gun for his remaining 14,000, and There are four additional players that have called the 24,000 big blind pre-flop. The flop comes A♥7♠3♠ and all four players check. The turn is the 9♦ and Gennadiy Kostrov bets out 25,000 from the small blind. The other three players fold and the hands are tabled. The 6♠ river does not change the hand, and McIntyre is eliminated in 9th place, taking home $13,712. After a back and forth raising war, Chris McIntyre is all in and has been called by Je Wook Oh. The board runs out J♣10♠3♠5♥4♣ awarding Oh the pot. After a VERY close count of chips, it's determined that McIntyre is left with less than a single big blind. Facing a raise from Brad St. Vincent in the cutoff, Ernie Hou shoves all in from the big blind for around 300,000, and St. Vincent calls. The flop comes J♥J♣10♣ leaving Hou in the lead with his two pair. But the 10♦ turn gives St. Vincent the lead with two pair (jacks and tens) with an ace kicker. Facing a raise from Chris Mac in early position, Frank Servidio shoves all in for around 200,000 in the big blind. Servideo calls and the players table their hands. The board runs out 9♥7♥2♣6♣4♠ eliminating Servidio in 11th place. The remaining ten players are now redrawing for their place at the final table of ten. Brad St. Vincent shoves all in for around 500,000 and Carlo Sciannameo calls. St. Vincent is behind holding 9♠9♥ against Sciannameo's J♦J♥. The Q♠2♣2♠ flop comes safe for Scianname, but the 9♦ turn gives St. Vincent a full house. Sciannameo will need to catch a jack on the river, but it's the 8♥ that arrives, and St. Vincent doubles up. Carlo Sciannameo shoves all in from middle position and Gennadiy Kostrov calls on the button. The board runs out A♣Q♦J♠K♦4♠ awarding Sciannameo a double. 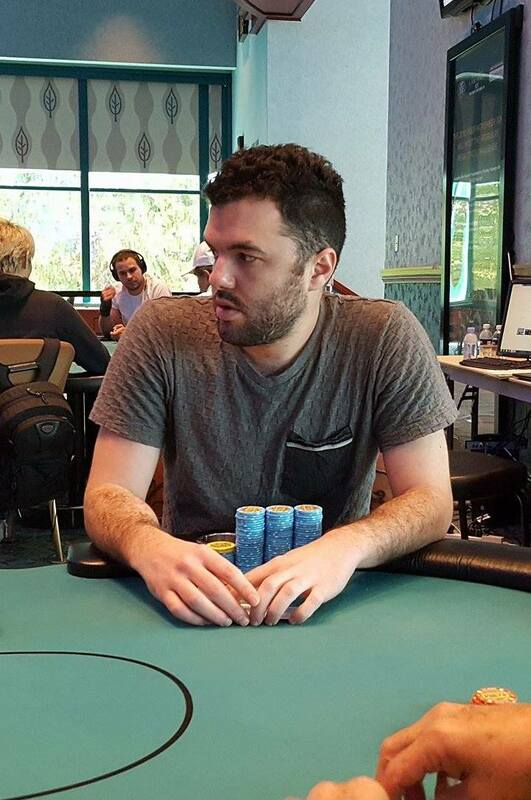 According to Chris Mac, he recently took down a pot with ace king. He had raised under the gun to 35,000 and Frank Servidio called in the small blind. The flop came A-9-7 and both players checked. They also both checked the 3 turn. The river was a king, and this time Servidio bet out 35,000 and Mac raised to 95,000. Servidio called, Mac turned over AK for top two, and Servidio folded.